Stanley have pulled out all the stops to bring you a state of the art portable organiser for safe and convenient transportation of tools. This Stanley 194231 is easily converted into a work station once opened (A-frame structure) and has the latest ergonomic features with, comfortable padded shoulder strap and rubber handle. The Stanley 194231 has a reinforced body and plastic sides that will protect your contents. The Stanley 194231 has plastic feet that gives protection from moisture and dirt, outer storage with outside pockets for storage of most frequently used tools, and on both sides the covers open outwards providing 100% visibility of your tools and they are organised in an upright position to enable easy access while on the job. Stanley know the needs of the day to day work load af tool organisers so they make them from durable materials that provide maximum protection against wear and tear. 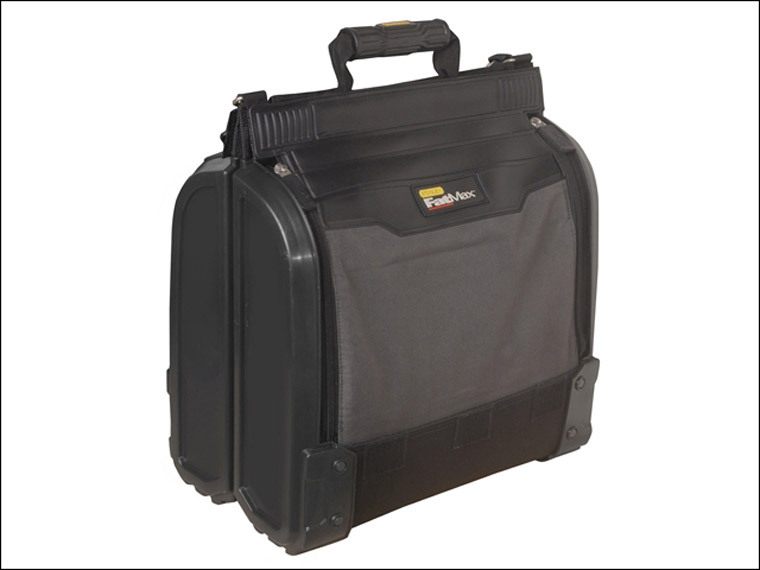 A state of the art portable organiser for safe and convenient transportation of tools which is easily converted into a work station once opened (A-Frame structure). High visibility of the tools on both sides as the cover opens outwards providing 100% visibility to contents. Tools are organised in an upright position to enable easy access while on the job. Dimensions: 39 x 25 x 44cm.